If we act, we can stop the Big Six from becoming the Titanic Three. As ETC first warned in May[i] last year and again in February[ii] this year, the pressure of two mergers among the Big Six Gene Giants would make a third merger inevitable. In the last few days the business media have reported that Monsanto is in separate talks with Bayer and BASF – the two German giants among agricultural input companies. While anti-competition regulators are fussing about the hook up of DuPont with Dow and of Syngenta with Chem China, Monsanto urgently needs to make a match. They hope that if regulators let the other two deals go through, they won’t be able to deny Monsanto a chance to even the score. If the companies get their way, the first links in the industrial food chain (seeds, pesticides) will be in the hands of just three companies. If the marriages of DuPont-Dow and Syngenta–Chem China go through and Monsanto merges with Bayer’s Agricultural division, the three will control more than 65% of global pesticide sales and almost 61% of commercial seed sales. If Monsanto and BASF strike a deal instead, the Titanic Three will still have almost 61% of pesticides and more than 57% of seeds (see chart below). Either way, a fourth move will be inevitable. Whichever company is left at the altar (Bayer or BASF) will have to buy or sell since it won’t have the clout to take on the Three. Either could prove irresistible for Deere & Co. or one of the other huge farm machinery companies that are in the best position to ultimately dominate all on-farm related agricultural inputs from seeds and pesticides to fertilizers, machinery, data and insurance. So What? Some industry watchers wonder if this latest spate of mergers will really make a difference to an industry which is already tightly-concentrated and where the six Gene Giants that have dominated seed and pesticide markets for the last decade already have so many joint ventures and cross-licensing arrangements that they have a de facto monopoly. From another perspective, peasant organizations and agroecologists neither buy corporate seeds nor want their pesticides. According to recent estimates[iii], at least 90% of the seeds that peasant farmers plant every year come from their own bins or are bartered with neighbours in local markets. Since these are the peasants that actually feed 70% of the world’s people, the machinations of multinationals could be considered of no matter. Causes for Concern: Commercial seeds may only make up 10% of peasants’ seed supplybut the corporations have virtually all of the “face time” with policymakers. Trade, farm subsidies, labour laws, patents, land use, phytosanitary regulations, infrastructure spending and marketing policies are skewed to the interests of the biggest agribusinesses and the 100 million farms they claim as clients. The 570 million peasant families[iv] that really feed the world bear the burden of these skewed policies – not just as a direct attack – but as collateral damage. The more concentrated the lobbying power of industrial agriculture, the more destruction to the Peasant Food Web and agroecological food systems. The threat is not only concentration but also integration. When pesticide companies began buying seed companies in the 1970s, the companies first denied it was happening and, later, argued that the synergies were beneficial. Four decades later, allowing seeds and chemicals to combine has done an enormous damage to plant breeding. 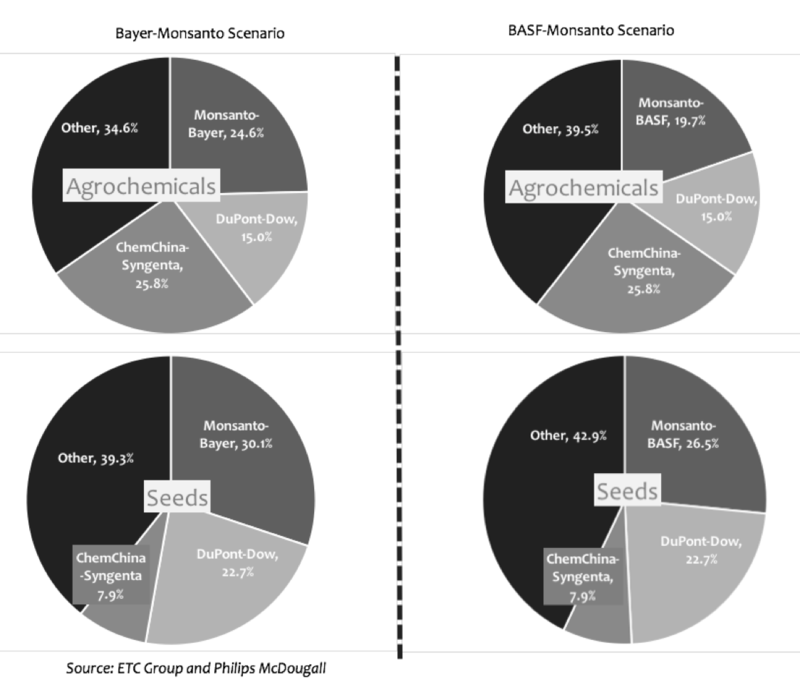 The agrochemical giants concentrate overwhelmingly on a handful of commodity crops (corn, soybean, cotton, etc.) engineered primarily to tolerate proprietary chemicals. The result has been a decline in the quality of plant breeding for conventional varieties and an increase in the use of crop chemicals. The impacts are especially devastating for farmers who want to get off the pesticide treadmill – they can’t get good seed and can’t escape their neighbour’s drifting pesticides. Policymakers – who refused to acknowledge the negative impacts of the seed/chemical complex - will now confront the next level of integration. 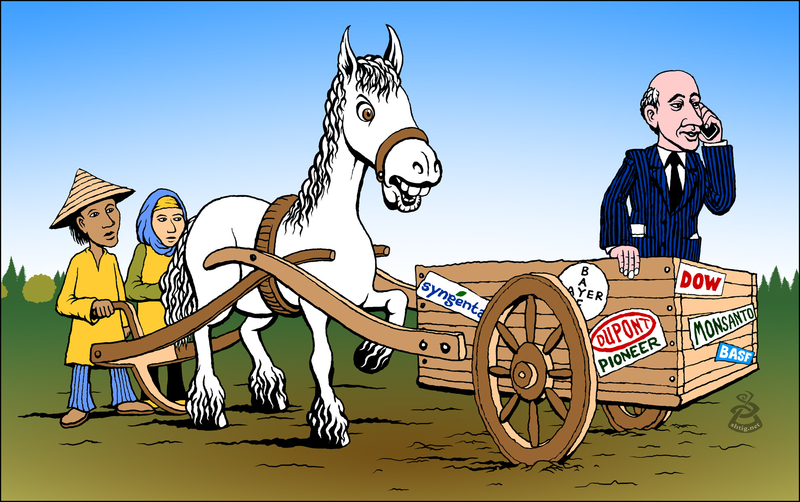 The world’s seed and pesticide businesses are small potatoes compared to the fertilizer and farm machinery industries. The farm machinery behemoth, Deere & Co., all by itself, has sales equivalent to about two thirds the sales of the entire seed industry. For the big three tractor companies that share 49% of the world market, taking over the big three seed/pesticide companies (with even greater concentration) seems a nice fit. If national anti-competition regulators allow the three seed and pesticide mega-mergers to go ahead, the slippery slope into machinery or fertilizer combinations will be hard to arrest. Winning Grounds: The mergers already on the table will not be decided in Washington or Brussels and victory won’t go to the highest-paid lawyers. It’s all about national politics and shareholder profits. Four countries (Brazil, China, India and Argentina) represent 28% of the global pesticide market. That’s the part of the market that is growing. Collectively, the global South is more important to the industry’s future than Europe and North America. If a handful of these countries block the merger at home, corporate shareholders will nix the mergers themselves without waiting for Washington or Brussels. Virtually every nation has a competition office or a foreign investment review office that has the right to step in and block combinations within their own borders. This can be a long drawn out and complicated legal dispute or it can be an act of political expediency. Who is likely to win? Politicians rarely lose votes challenging multinational interlopers. Countries also have national commercial champions they would like to someday move into global markets. Allowing mega-mergers at home will damage their long term aspirations abroad. Then, too, oligopolies raise prices. Sometimes, this means increased payouts for government subsidies. In all cases, it creates hardship and political unrest in rural areas. Finally, highly-concentrated industries would rather spend their money on public relations then on R&D. Mergers are innovation-killers. There is just no commercial incentive to innovate when you already control the market. For an agroecologist, of course, having an innovative pesticide company is about as helpful as having a smart pest. But, the bigger these companies have grown, the more they have destroyed truly innovative public research. If mergers are blocked, the next step is to rebuild a truly responsive research system led by peasants and agroecological farmers. Almost every country has at least one office that examines commercial mergers that could lead to anti-competitive markets. Most countries also have offices that review foreign investment or, especially, foreign takeovers of domestic companies. While action in every country is important, below are the contact points for the four countries in the global South that account for 28% of the world pesticide market. For further information on what individuals and organizations can do to challenge mergers in their country, please contact us at etc@etcgroup.org using the subject line: “More Information on Mega-Mergers Requested”. An action sheet on further initiatives will shortly be available in English, French Spanish and Portuguese.